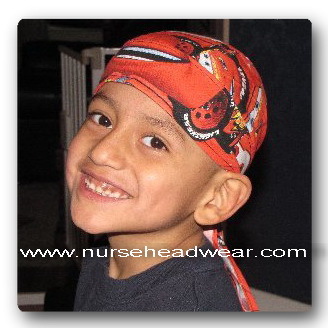 We offer kid's headwear in all of the same styles as our regular headwear...just smaller. All we need is your child's head measurement. We can even make infant sized headwear! Now...how do you go about ordering kid's headwear? #1 - Browse through all of our fabrics and then come back here and type your fabric selection into the box, below, that says "Fabric Selection". Please make sure you type in the exact fabric name that you want. We wouldn't want to send the wrong fabric because of a missing word. #2 - Click on the button beside the headwear that you want to buy. 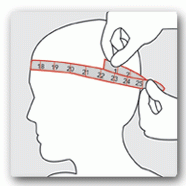 #3 - Type your child's head measurement into the box that says "Head Measurement". ***Measure from center of forehead around fullest part of head. Check out our cute-as-can-be kid's headwear model!!! Lucas had to get his head shaved for surgery and he loved his headwear so much that he asked to have his head shaved three days EARLY...and his parents did it for him! His brother and sister also asked if they could have their heads shaved so that they could wear some cool headwear, too...didn't work:) Lucas is doing wonderful after his surgery! 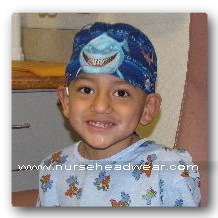 Lucas is wearing a 'Cars' kid's bandana on the left and a 'Nemo's Shark, Bruce' kid's surgical cap on the right.